Colour correction can be one of the most exciting but challenging treatments for a stylist to carry out on a client. 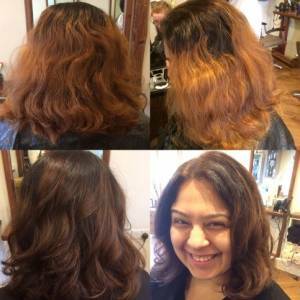 This client had previously tried Balayage colouring method which left the client’s hair with excessive and uneven orange tone. This was not the look this client was expecting and really wanted this resolved as soon as possible. 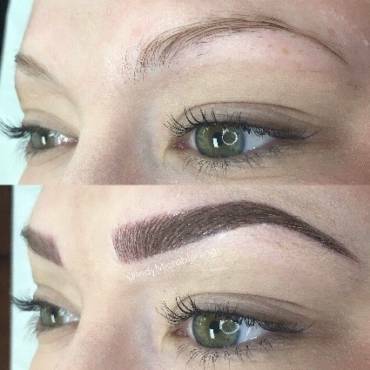 After being recommended to Lucia Hair and Beauty the client received a skin and strand test straight away to ensure Lucia could give this client optimum results for a special occasion which the client was attending at the weekend. With Lucia’s fantastic knowledge of colour and the amazing L’Oréal professional colour range, the client left feeling fantastic and her hair had a beautiful chocolate brown Balayage effect. Rich ash chocolate and a warm dark blonde from L’Oreal French Girl collection was applied to the head using full head and slicing method. This collection of browns with copper red and gold undertones gives white hair full coverage whist avoiding a colour that is too flat and unnatural looking. With the added use of L’Oréal professionals Smartbond the client’s hair was left feeling strong, soft and shiny. Something that is hard to achieve with this amount of colouring. Add Smartbond to your next colour appointment for only £8.50. For a free colour consultation contact the salon directly on 07425 888588.